The Mary Winspear Centre has a long history of community support and pride, which continue to be strong foundations of our facility. Born in 1901 in Birmingham, England, Mary Willan Winspear's life spanned almost a complete century! In 1910, the family joined many new émigrés and boarded the "Empress of Britain" and sailed to Canada, settling for a short period of time in Calgary, Alberta. They soon moved to Namaka, a small railroad town 40 miles east, that no longer exists on maps today. Mary grew up in a family of five children with very strong ties to the Anglican Church and a belief in the value of an education. She was schooled in Namaka's one-room, red-framed schoolhouse. All of the siblings excelled in their chosen vocation and Mary followed in her mother's footsteps and chose education. After graduating from grade 12, Mary went on to teach in that same schoolhouse. One of her students was her younger sister. Looking to broaden her education and work experience, in 1927 she convinced her sister to go east with her to St. Hilda's College at the University of Toronto. Together they had saved $1500 for the adventure. Mary completed her undergraduate degree in 1930 and then continued on at the same university, earning both her MA in English (1931) and PhD in Philosophy (1942). She became Dean of Women at both the University of Alberta and Queen's University and lectured in English at the Universities of Alberta, McGill, Concordia and Queen's. When the veterans returned from World War II teaching opportunities for women in universities took a drastic downturn. It was at this stage, in 1946, that Mary bought "a respected but somewhat run down schoolhouse," as her sister described it, in the Westmount area of Montreal, Quebec. She spent 25 years there as headmistress and owner of what was called Weston School, a private school for girls. Her time as headmistress and was marked by two main characteristics. She was an outstanding educator. She pioneered, for example, the concept of teaching classes in both French and English, whichever was the more appropriate language for that subject, so that her students became bilingual. Also, she had exceptional interest in and empathy for her students and for this she was much loved and respected. Weston School closed its doors after operating for 90 years in June of 2007. Mary had spent many of her summers visiting her younger brother Francis at his summer house in North Saanich, British Columbia and upon her retirement, she moved to the neighbouring small town of Sidney, settling into the community. She continued to live an independent and active life, keeping an active mind as an avid reader and as a keen and regular bridge player. She took an interest in her community and its constituents and enjoyed the arts, the love of learning and, of course, the seascape so abundant in this area. Mary never married but she remained a favourite aunt to three generations of nieces and nephews. The Winspear family who are now dispersed throughout continental North America continue to celebrate her life and legacy by assisting the Sanscha Community Cultural Centre Foundation's Honouring the Past - Building For the Future Campaign. The beautiful new community cultural centre built by the foundation is named in her honour and is called the Mary Winspear Centre. In May 2000, the Sanscha Community Cultural Centre Foundation’s Honouring the Past – Building for the Future Campaign received a generous gift from Charlie White, well known sports fisherman, author, television personality, entrepreneur and inventor. To those who knew him, Charlie was a man with a twinkle in his eye, a clear sign of the inspired genius and unbounded energy that helped him to build a remarkable personal history that goes far beyond North Saanich, the community he and his wife Darlene called home. In his lifetime, Charlie was no stranger to creating lasting legacies and his gift towards the Charlie White Theatre at the Mary Winspear Centre fit right into his life long pattern. “In my life I have taken risks, faced many challenges and been fortunate to have been able to work and be successful in areas I’ve enjoyed – those closest to my heart. Throughout it all I’ve always felt it was important to contribute in a positive way to those around me and to give something back to the community that has been so supportive of me over the years. I think the Mary Winspear Centre at Sanscha is of critical importance for our area. The new Centre gives people of all ages a central place to come together to learn, to share experiences with one another and to grow as individuals. It is a privilege for my wife Darlene, and I, to help contribute to its success,” explained Charlie. Throughout his lifetime, he created his own incredible legacy of legendary accomplishments. Starting in the early 1950’s, Charlie started a TV listings guide that later became TV GUIDE. Closer to home, Charlie was the genius behind the establishment of CHEK TV and then CHAN-TV, which eventually became BCTV. In the early 1960’s Charlie owned and operated CFAX radio. Then, inspired by his love of the underwater world, Charlie built Victoria’s Undersea Gardens and then three more such attractions in Seattle Washington, Newport Oregon and Santa Barbara California. Charlie went on to invent the Scotty Downrigger, which has become the sports standard when trolling for fish. In his later life, Charlie’s work focused on the production of documentaries on the underwater life of salmon and other species of fish and sea mammals – shot on location throughout the world, the underwater footage with his remote controlled underwater camera. His 39 episode television series, “Charlie White’s Underwater World”, has played across Canada, the USA, Europe and Japan. Ralph E Bodine was born in Phoenix, Arizona and lived in the United States of America until 1992. During that time he graduated from Princeton University with a bachelor's degree in economics (1966), and played a leadership role in many of the largest fruit growers' organizations of the United States. Bodine served as Chairman of Western Growers Association, the Fruit Growers Supply Company, and Sunkist Growers, Inc. and in 1990 was appointed Chair of the President's Council on Rural America, by President Bush. In 1992 Ralph and his wife Linda immigrated to Canada and are now active members of the Saanich Peninsula. Today Ralph is a member of the Royal B.C. Museum's board of directors, involved in the University of Victoria Foundation and is committed to the boards of a number of new start-up companies. Thomas Alexander Lebbetter was born in Yarmouth, Nova Scotia. His family moved to Ottawa when he was a teenager. Tom joined the Canadian Navy at 17 and performed active duty near the end of World War II. After the war, he attended Saint Francis Xavier University where he received his Bachelors degree and then the University of Manitoba for his Doctor of Medicine degree. He received his certificate of specialty in Urology in 1961, while training at the Royal Victoria Hospital in Montreal, and later his fellowship. Although a specialist, he moved to Sidney in 1975 and began a general family practice. This was a blessing for him and for the community. 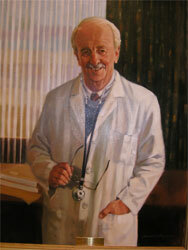 He became a true “old school” physician, always approachable, always with time to spend for any and every patient. His twenty-six years in the community was marked by dedication, friendships, humour and compassion. A generous father, a patriotic Canadian, he was a modest and religious man. “Dr. Tom” was a friend this town will miss. Myfanwy Pavelic was an Island Girl. She was born as Myfanwy Spencer in Victoria, on April 27, 1916 and passed away in 2007. Her grandfather, David Spencer, opened the first dry goods store in Victoria; and his home was donated by Myfanwy’s aunt to become the present home of the Greater Victoria Art Gallery. 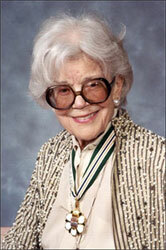 Myfanwy was one of Canada’s best known portrait artists. 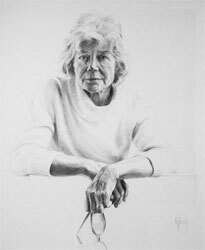 She had done portraits of Queen Elizabeth and Prime Minister Trudeau, plus many famous musicians, and others who were close to her during her life. She also completed several self portraits, the first of which she drew when she was just 8 years old. This was the same age that she met the artist Emily Carr who became a close friend and mentor. In addition to her love of art, music was also a love of Myfanwy’s and she became an accomplished pianist. With her heart rooted in Sidney, she traveled the world to study both music and art. New York eventually became her second home and it is here that she met and fell in love with her husband, Nikola Pavelic. Nikola was a Doctor of Law, and the son of a former Prime Minister of Yugoslavia. They married in 1948, and moved to Sidney in 1950 where they had their daughter Tessa. In 1956 they moved to New York again, and for the next 13 years divided their year between New York and their home in Sidney. With her husband’s continuing strong interest in and support of her work she built her “dream studio” on their ‘Spencerwood’ home site in 1969. 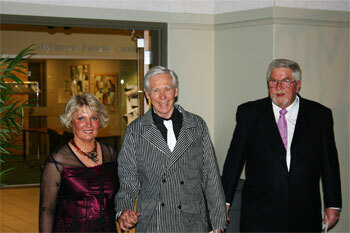 She joined a significant group of Victoria artists during the 1970’s called the Limners. In 1975 she became a member of the Royal Canadian Academy, and in 1984 received both an honourary Doctorate from the University of Victoria and the Order of Canada. This was followed by the Order of British Columbia in 2001. In the year 2000 Myfanwy Pavelic generously donated 50 pieces of her art to help support both the Victoria Symphony and the dream of constructing the Mary Winspear Centre in Sidney. She combined her love of music and her love of her community for a tremendous fundraising effort. Some of her admirers and supporters of the Mary Winspear Centre bought 4 of her works and donated them back to the Mary Winspear Centre to be hung in a separate glass fronted room complete with a board room table and chairs next to the Myfanwy Pavelic Gallery. What a memorable place to hold a meeting- surrounded by art works of a truly great and generous artist. Myfanwy Pavelic had many philanthropic activities. She supported the Sanscha Hall (Mary Winspear Centre) in Sidney, the Victoria Symphony, Art Gallery of Greater Victoria, Metchosin Summer School of the Arts, Sooke Fine Arts Organization and the University of Victoria.